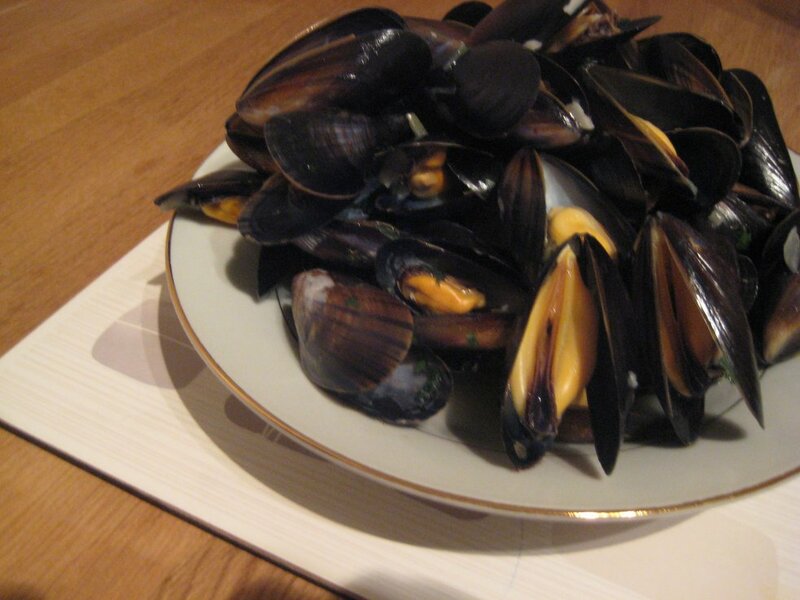 One of the absolute classic shellfish dishes is Moules Mariniere – mussels in a garlicky white wine sauce. Pleasingly it’s also an amazingly simple and quick dish to cook, although the mussels do need a little bit of time to prepare them. They are one of the few examples of seafood that are perfectly suited to farming. They simply hang some ropes from buoys, seed them and let nature take it’s course. Then after 3 years they lift the ropes up and grab the mussels, there’s no dredging and you don’t get the gritty mussels you get from the dredged farms on the continent. Just amazing shellfish. The mussels farmed this way in Scotland are supplied to fishmongers and supermarkets all over the country so you can even get decent quality mussels from most towns. At the moment we’re on a low-fat regime in our house, though not for cosmetic reasons. Having said that if I lose a little fat/weight I won’t be complaining! For that reason I replaced the butter with some olive oil and the double cream with low-fat creme fraiche but I don’t advise you do the same if you can avoid it as that extra fat equals extra flavour! Prepare the mussels by rinsing in cold water, removing the beards and discarding any that are broken or don’t close when tapped. Heat a large saucepan then gently sweat and soften the onion in a little bit of the butter until it starts to brown. Turn the heat up then add the mussels and the wine, cover and steam the mussels for 3 to 5 minutes. Once they’ve opened up they’re ready. Add the parsley and stir the pot, drain the mussels but keep the sauce. Put the sauce back on the heat, add some double cream and some pepper then bring to the boil for 5 minutes until it’s thickened. Pour the sauce over the mussels and serve with good, fresh, crusty bread.